The Bronco's long gone. Land Rovers are expensive. Chrysler's got no money. Seems like a perfect time for an automaker to take a run at the rock-crawler segment. Hyundai US CEO John Krafcik told us they may do just that. We asked Hyundai US CEO John Krafcik over dinner at Slow's BBQ (go eat there, like, now) the other night during the Detroit Auto Show what new segments the Korean automaker is looking at for future expansion. More on some of that shortly, but what blew our mind was the answer he gave when pressed about other types of vehicles — say, 4WD SUVs. Krafcik responded by telling us that "every time our designers get together and start looking at concepts and the future, the first thing that comes out of those meetings — what everyone gets excited about — is the prospect of a Bronco-like, highly-capable off-roader." As a follow-up on that answer, I asked if he meant a Wrangler-fighter. He answered only by smiling and repeating himself — "highly-capable." Given Chrysler's sorry fiscal state, don't expect the R&D monies for a new Jeep Wrangler to materialize anytime soon — which means the Wrangler's at its weakest cycle point in its product lifetime. That makes right now the perfect time for an automaker to come out with something — anything — to compete with the old man of 4WD vehicles. We'd love to see it. Our bet is this means we'll be seeing a concept in the near-term future — maybe Chicago or New York — to gauge interest. So, let us know below if it's something you'd be really interested in seeing out of Hyundai. FYI to FoMoCo forum-hounds: The image up top? It's not real. It's a photoshop of the ol' Bronco concept. 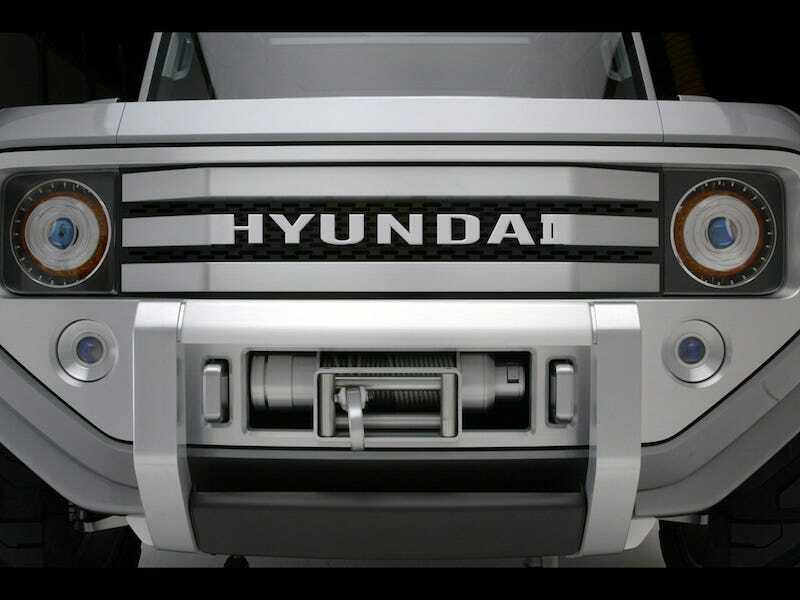 I want to stop reading in the forum posts that you think it's an actual image of an actual Hyundai concept, OK?